In the land famous for it’s breathtaking space, a new form of space is introduced. A square which resembles a park; a park which resembles a square; Reykjavík Square Park. Together with the new Winter Garden Hotel strongly projected in the existing unclear urban structure, an overall coherence and clear connected urban fabric is created. Reykjavík Square Park operates on different scales, it results in meaningful attractive public space and will be the start of the new city-green-corridor-strategy. Different from the open urban areas in Reykjavik, which work when there is a crowd, the Reykjavík Square Park introduces a scale which responds also to the individual. It’s a space for residents and tourists, for children and the elderly, imparting the strong local history. From graveyard to ornamental garden, from parking lot to skate-park. The ‘squares’ Ingólfstorg and Víkurgarður have often changed their characters and physical layout. Located on the west side of the old city centre, Víkurgarður can, nowadays, be considered as a place of history. Ingólfstorg as a place of activity. On the east side of the old city centre, bordered by Laekjargata, lies Arnaholl, the place of celebration. The two sides of the old city centre are connected by Austurstraeti and in between lies, in front of the parliament, Austurvöllur, the place of gathering. This all captured between harbour and lake, in the north and south, one could say the structure of the old city centre of Reykjavik is very clear. Nevertheless, due to the dynamics of a city centre and change of scale of buildings, creating frontsides on one square and backsides on the other, the Kvosin plan part of the old city centre can be considered as the weakest point in the old city centre. The interconnection, via alleys and backsides, between the squares Ingólfstorg, Víkurgarður and Austurvöllur is very poorly, provoking plan after plan for this area. Today is the moment to truly clarify this part of the centre. Creating strong and interesting connections, to make attractive frontsides to the squares, to give Austurstraeti an attractive end (or start), to celebrate space. In addition the redevelopment of the Kvosin plan and the redevelopment of the old airport area Vatnsmýri will give a great opportunity for the city of Reykjavik as a whole. 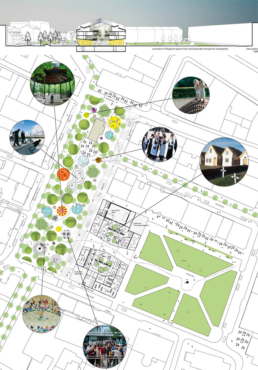 By using Reykjavík Square Park as a stepping stone and by introducing a green infrastructure on the corridors of the city center a strong linkage can be made between nature and the historical city centre. Reykjavík Square Park starts from the existing qualities of the area and brings solution in regard to history. By eliminating the border, build up by an undefi ned alley and backsides, between Ingólfstorg and Víkurgarður, a wide open, well orientated, space is created, referencing the wide Aðalstræti from the 19th century. By creating this one place all the historical buildings in this west part of the city center will be addressed at once and the story of backsides and unsafe alleys comes to an end. An open space is created with a tradition of nonconformity. Reykjavík Square Park will be one of the city’s popular spots for both residents and tourists. By day inviting, open and friendly. By night sparkling, pumping, a perfect background for the active night life. It will be a place to stroll and to fi nd your friends. First of all, a new, but familiar, landscape is created. A landscape of hills, some fl at, some with volume. By respecting the historical elements of the park-square and by introducing new elements; a landscape of 1000 activities is created. From skate-park to the place-wheresages- will-be-told, from playground to a sunny terrace, every activity can fi nd it’s place. The statue of Skúli Magnússon, the Víkurgarður cemetery and the old tree of Schierbeck are properly reconnected to the heart of Reykjavik. Even the old söluturninum and the old Vikhotel (Vallarstræti 4) can fi nd a perfect fit. 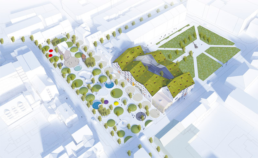 The people of Reykjavik will be given the opportunity the speak up and tell which new activities they would like to see on Reykjavík Square Park. The most popular activities will be created in genuine of the plan. The layout provides fl exibility and can adjust easily to the ever changing demands. 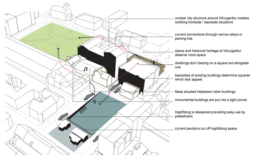 The new hotel too plays a signifi cant role in clarifying the existing urban fabric. 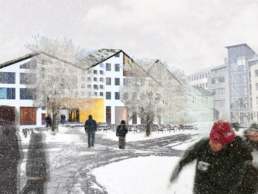 The building will address both Reykjavík Square Park and Austurvöllur and provides these two pubic spaces with attractive front-sides and a clear connection; The Winter Garden. This covered public connection is also the entrance and the lobby of the new hotel. The hotel will play an important role in activating the public areas. Shops, supporting activities, like cloth-pressing, and nightclub Nasa will be positioned in the ground floor. The scale differences of buildings in Reykjavik is interesting though challenging. The new hotel will combines these differences of scale: low at the public areas and higher in the middle. The hotel also connects the past and the new by including two monumental buildings. On the corner on Austurvöllur (Thorvaldsensstræti 2) a restaurant open to public and hotel is situated while the opposite corner the relocated Aðalstræti 7 will be the place to make reservations and start expeditions to the wide open space of Iceland’s nature. Combinations in scale and history is also translated to the building’s materialisation. Façades of concrete containing large Icelandic stones are topped with a green roofing of thick Icelandic grass like the traditional grass-houses. The Winter Garden Hotel combines local materials and proven traditions with a optimistic and appealing approach for the future. Reykjavík Square Park does not take the urban errors of the 80s as a starting point, but instead creates a clear framework for history and opens up the old city centre to new chances and a bright future. 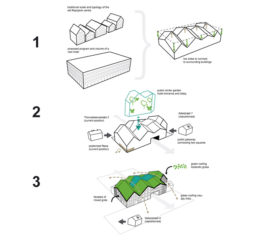 By carefully repositioning the existing functions in and around the plan site, well addressed and inspiring public spaces are created, guaranteeing a breath of new life in to the city.